This is a rare pair of Middle Bronze Age gold earrings, dating to 1400 - 700 B.C. 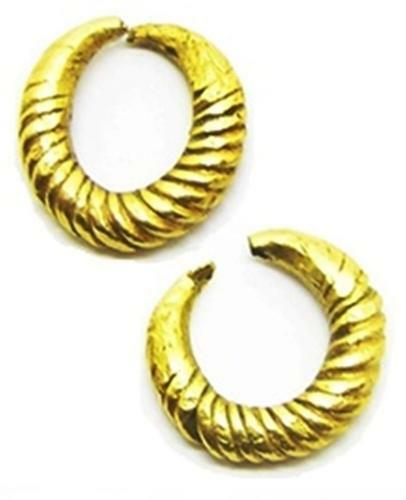 These earrings are known as 'Bar Twisted Rings', recent research has disproved their use as 'ring-money' coinage, terming such ornaments as decorative pieces of jewelry. It is likely this is a set of earrings or a form of hair ornament (i.e. 'beard rings'). Similar pieces can be seen in the British Museum mainly from Ireland. DATE: c. 1400 - 700 B.C. PROVENANCE: Ex. Robinson collection Essex, England.